Barricade Rust Protection for firearms rapidly drives out moisture from firearm metal pores and deposits a transparent protective coating which seals the surface. It’s the best way to protect your firearms from rust. Withstands 500 hours in ASTM humidity test and 96 hours in ASTM salt spray test. 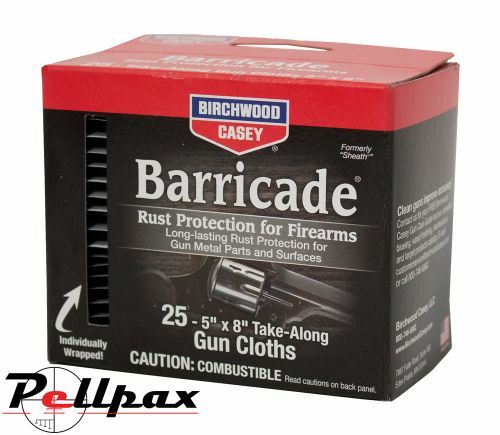 Barricade Rust Protection for firearms is also an excellent penetrant for loosening rusty or frozen parts, as well as a good lubricant and an effective bore cleaner. These impregnated cloths are quick and easy to use for protection whilst out in the field. Sold in box of 25 cloths. Add this item to your basket & spend an extra £490.51 to apply for finance.